On May 23, Mary Queen of Peace Parish hosted the University of Notre Dame Folk Choir with free-will offering going to Catholic Charities of St. Louis. It was evening filled with heavenly sounds from the talented, collegiate choir. 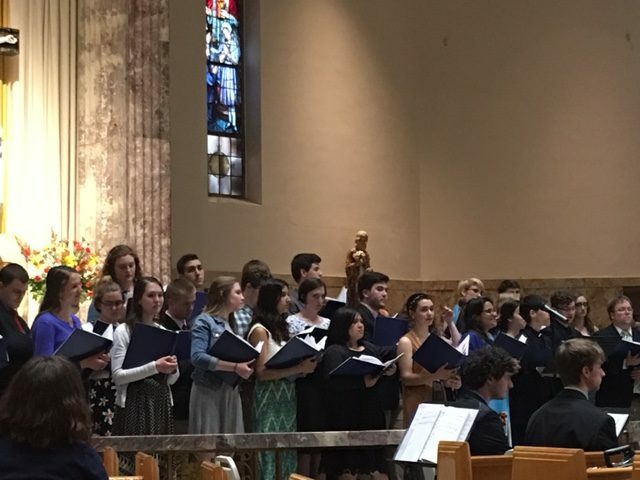 With the church filled with parishioners and opened to the public, the audience had the treat of listening to the choir comprised of sixty vocalists and musicians that serves as one of the University of Notre Dame’s principal liturgical choirs. The Folk Choir is presently on its “Heartland Tour” this Spring, performing its spiritual and folk songs from the past and even new ones written from members of this choir. We are grateful to Mary Queen of Peace parish for their generosity to Catholic Charities of St. Louis with their offerings that evening as well as treating us to an evening of beautiful music performed by the University of Notre Dame Folk Choir.